Shop for AppleCheeks NEW You Rock Diaper print! 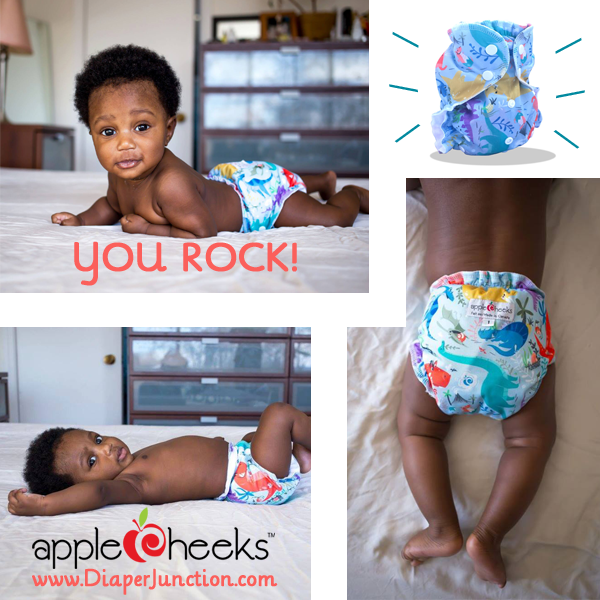 You Rock, the newest print from AppleCheeks Cloth Diapers is in stock! Introducing 'YOU ROCK' from AppleCheeks! You Rock is a first of it's kind for AppleCheeks, adorable dinosaurs in bright colors with wide grins make this super fun print popular with babies and toddlers, and YES, babies and toddlers can become quite fond of certain diaper prints! Diaper Junction has the new 'YOU ROCK' print in stock in the OneSize Envelope Cover, Mini Zip and Storage Sac! AppleCheeks Envelope Covers are constructed of a breathable, waterproof PUL outer layer that is sewn to a buttery soft microfleece inner layer for ultra softness against your little one’s sensitive skin. The waist and leg openings are designed with a snug, durable elastic to guarantee a gentle and secure fit. Two rows of easy-to-adjust snaps allow you to get the perfect fit every time. NOW this revolutionary cover is available in a one size option. Shop our selection of AppleCheeks cloth diapers and accessories here.